The popular summertime sandwich also makes a delicious salad. An avocado, buttermilk, and lime juice dressing adds a finishing touch to this recipe. 1 of 1 Cook bacon in a large skillet over medium-high heat for 8 minutes or until crisp. Remove bacon and drain on a paper-towel-lined plate; pour off drippings and reserve. Wipe out skillet. 1 of 5 Place avocado, buttermilk, onion, lime juice, 1/4 teaspoon each of the salt, black pepper and cayenne in a blender and puree until smooth; set aside. 2 of 5 Stir together cornmeal, remaining 1/2 teaspoon salt and 1/4 teaspoon each black pepper and cayenne in shallow dish; place flour and egg in separate shallow dishes. 3 of 5 Dip tomato slices in flour, then egg, then cornmeal mixture to coat. 4 of 5 Heat canola oil and 1 tablespoon of the reserved bacon drippings in skillet over medium-high heat. Fry tomatoes in a single layer for about 2 to 3 minutes per side or until golden brown. Repeat with remaining tomatoes. 5 of 5 Place romaine lettuce in a large bowl and toss with bacon and 2/3 cup of the avocado dressing. 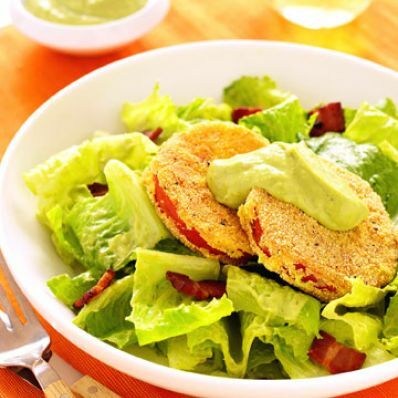 Place about 2 cups salad on each plate and top with 2 to 3 fried tomato slices. Dollop with a little of the remaining dressing and serve. Per Serving: 1019 mg sodium, 7 g fiber, 8 g sat. fat, 77 mg chol., 26 g Fat, total, 34 g carb., 13 g pro., 425 kcal cal.